Beautiful building located near the "bastions mediaevali" about 300 meters from the central Piazza Castello, with its famous "lookout", consisting of two adjoining buildings with a fully fenced backyard through a brick wall and driveway gate remote-controlled. The pricipale building, located to the east, 'was created in the late 1800s and is on three floors above ground, ground, first and second. second floor: hallway, kitchen, living room, two bedrooms, utility room, bathroom. Interior rooms are very spacious with beautiful times of particular value are the frescoes on the ceiling on the first floor walls. The frescoes have been largely absent from Giovanni Savio, a painter La Morra lived in France but often returned to Italy to work. 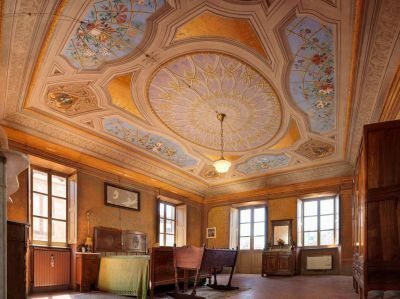 There are his works in the Castle of Barolo, Novello, in Oak home, house Bozzi already 'house Savio, Falletti Palace, numerous interventions in Turin in historic buildings. At his school they were formed personalities such as Augustus Morocco, director of the Ecole Municipale d'Art Decoratif the Principality of Monaco, a member of the National dell 'Unesco Commission. To the west of the building above there 'another property more' venerable of precedent that is spread over two floors. Of particular interest are the frescoes on the facade facing the inner courtyard increasingly Giovanni Savio. First floor: large utility room, a space for use eviction, a large covered terrace. The property 'Architectural, also suitable for a foreign clientele, interesting as prestigious residence or destination turistco / accommodation. Property for sale with an exclusive mandate.